Hattiesburg, Mississippi, is a true Daylily Destination. Here you will find untold enthusiasm and excitement for the proud flower that awakens fresh to a new world each day, the elusive daylily. The Hattiesburg Area Daylily Society is one of the largest groups of daylily enthusiasts in the national daylily organization, the 10,000 member American Daylily Society. In the Hattiesburg society you will find a breadth of daylily involvement from the large show gardens, to the couple with a few plants in their front yard flower bed. The 24th Annual Daylily Show will be held at the Lake Terrace Convention Center on Hwy 49 N in Hattiesburg. The display area will be open to the public from 1-4 pm. The Daylily Show will also include a design division. There will be a plant sale that opens at 11 am. Attendees may register to win a daylily. the plant for all reasons! 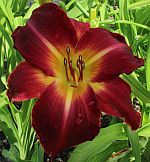 The Hattiesburg Area Daylily Society (HADS) is an organization of individuals who share the love of daylilies, and who are in harmony with the objectives of the Society. The objectives of HADS are to promote the knowledge and growing of the genus Hemerocallis through programs, workshops, exhibits, and fellowship with other growers at the local, regional and national level of the American Hemerocallis Society. To request additional information about the Hattiesburg Daylily Society, click Contact. For a history of the Hattiesburg Daylily Society, click here. Meetings of the Society are held the third Sunday of each month during September, October, and January through May. Meetings feature topical programs, plant auctions, door prizes, refreshments, great hospitality and fellowship. New members and guests are always welcome. A complete list of monthly programs and events is found by clicking Events. Note: Unless otherwise specified, all meetings are held at the Forrest County Multi-Purpose Center on US Highway 49 South of Hattiesburg. Click here for driving directions. There are daylily gardens throughout the Hattiesburg area, in private gardens, and in public planting areas. For additional garden details, click Events. Daylily plants are available for purchase from several area growers. The Daylily was designated as the official flower of Hattiesburg, Mississippi, by Hattiesburg City Council action in September, 2008.